Deserts are stretches of sandy or rocky land where rain and vegetation is scarce. Sometimes there is nothing for miles except mounds of sand. These are called sand dunes. 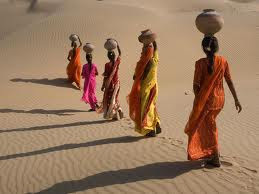 Rajasthan, a state that lies south­west of the plains of northern India, is the main desert area of our country. It is divided into two halves, the western and eastern, by the Aravalli Hills. The western part is called the Indian Desert or Thar Desert (see map). The climate in the deserts is extreme. The summers are very hot and dry. Sandstorms are common in this season. Water becomes scarce and in many places there is severe drought. 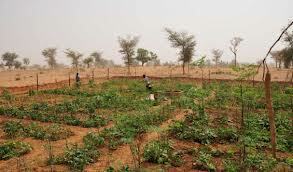 Most places receive little or no rainfall. The winter days are sunny and cool. At night, because the sand cools down quickly, it becomes bitterly cold. 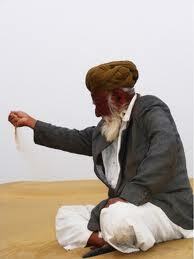 There are no permanent rivers in the deserts due to very poor rainfall. But in some places the underground water rises to the surface. This forms small pools of water right in the middle of the desert. Such a place is called an oasis. 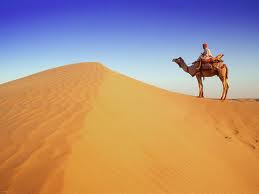 Many people in the deserts are nomads. Nomads rear cattle like goats, cows and camels. They keep moving from one place to another with their animals in search of food and water for them. Some of them are craftsmen and make a living by selling their goods. Some people grow crops like bajra, jowar, wheat and mustard seeds. There are also many industries (textiles, sugar, cement, fertilisers, etc.) and mines (lead, zinc, iron-ore, etc.) that provide people of this region with means of livelihood. Handicrafts and jewellery made in Rajasthan are sold in many parts of India and the world. The women of Rajasthan wear colourful ghaghra-cholis with an odhni or chunni. The men wear dhoti-kurta with turbans to protect themselves from the harsh sun.